In my last blog post, I described how my touring exhibition of round wall hangings, Woven Woods, came to be. This collection is now launched at its first venue at Art Gallery of Burlington and will be there until January 28, 2018. It will then move on to several other venues until 2021. You can imagine that after four years of dreaming and working toward this goal, it might be hard to let it go. Well, not surprisingly, it turns out that circles are simply irresistible. No sooner had I finished the last wall hanging for Woven Woods, an intriguing new direction presented itself. 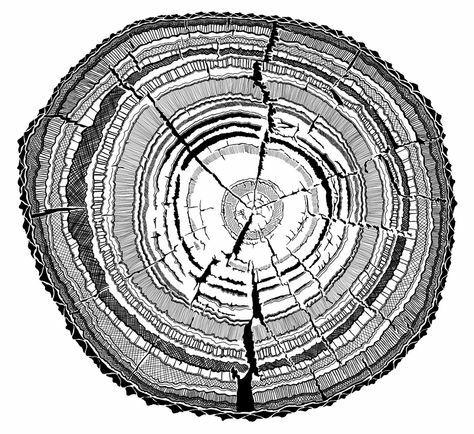 I was checking out images of cut tree trunks, when it occurred to me that tree rings have a great deal to say. They tell us about a tree’s history, about growth and aging, about endurance, about how their stories grow from the heart and mark them forever. Circles are symbols of eternity and commitment. 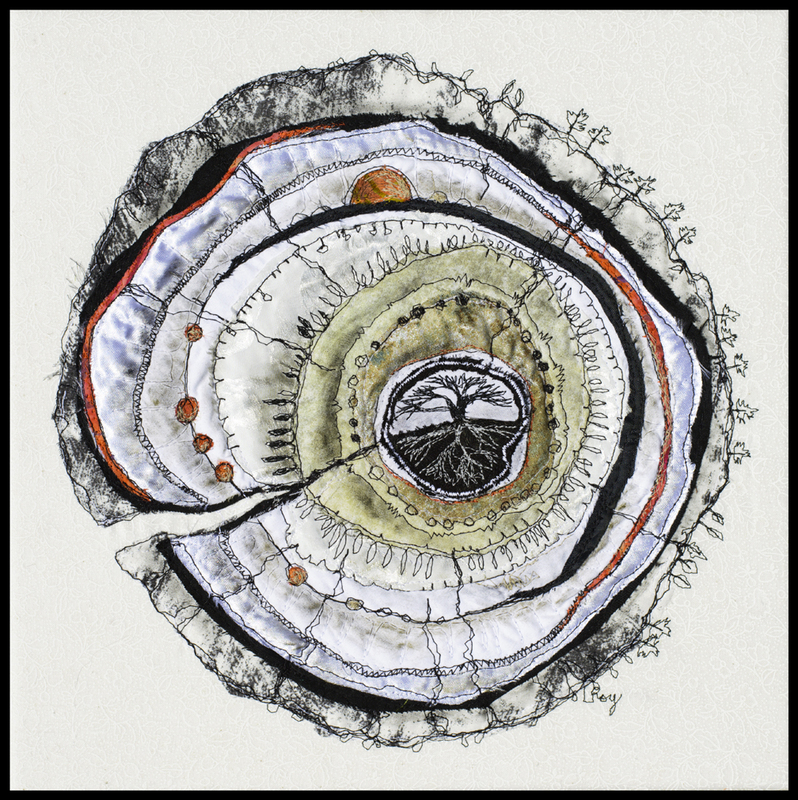 I thought that these tree rings might help me better understand trees, from the inside out. As I studied various types of cut tree stumps and their rings, it struck me how differently trees must experience their world from that of humans. As mobile bilateral beings, we humans interpret our surroundings from the centralized perspective of our brain. Trees however are radial beings, with no bundled nervous system, and live their entire lives in a fixed position. In spite of these limitations, we know now that they developed sophisticated ways to communicate with each other. 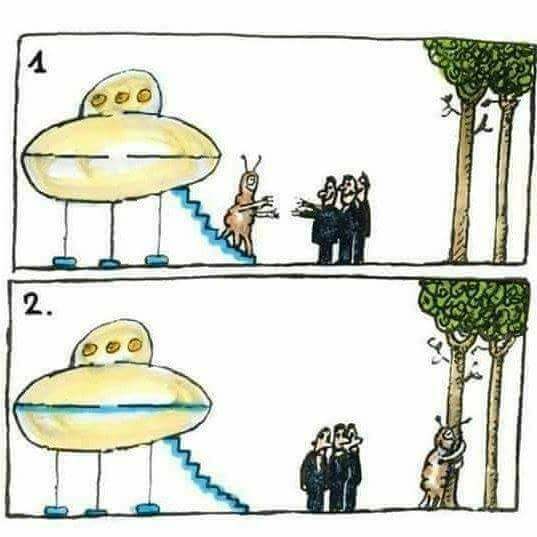 Wouldn’t it then be natural to wonder if trees might share their consciousness with beings like us? Moreover, is it possible for us to reach out to them too? Right around that time, the movie Arrival came out. The film is based on a short story in “Story of Your Life” by Ted Chiang. In the story, an alien ship lands on earth, and the life forms on it, mobile radial beings, are desperately attempting to communicate. A specially trained linguist is hired to decipher their written language, which is comprised of intensely ornamented circles and spirals. By the end of the movie, we understand that these beings use a communication system that incorporates time – past, present and future – in each of their missives. Time for them is measured in a circular way. This new language is in fact their special gift to us – reminding us that we must always take into consideration the karmic effect of our thoughts and actions. This led to an exciting AHA! moment for me, in support of a fresh approach to relational experience. Of course, in my online research I came across numerous techniques for approaching and communing with trees – some arising from ancient cultures, others that seemed, well, just made up. Here is one of the better examples, a very detailed series of steps of Chinese origin: How to befriend a Tree. As I’ve said before, I’m a doubting Thomas when it comes to most of this new age stuff. Still, my direct experience tells me there is a distinct field of energy that surrounds each tree, and the strength varies greatly from one to another. I can feel it. I wonder, does the tree also feel me? 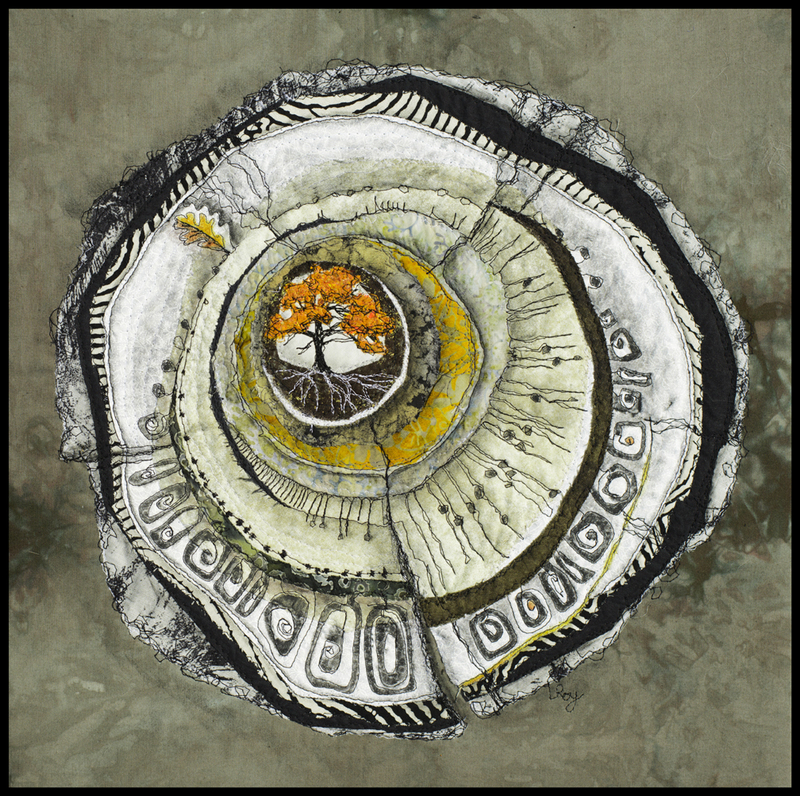 Working with tree rings in fabric is a rare delight – there is an unlimited scope for play and ornament using the wealth of shapes and structures that nature provides. 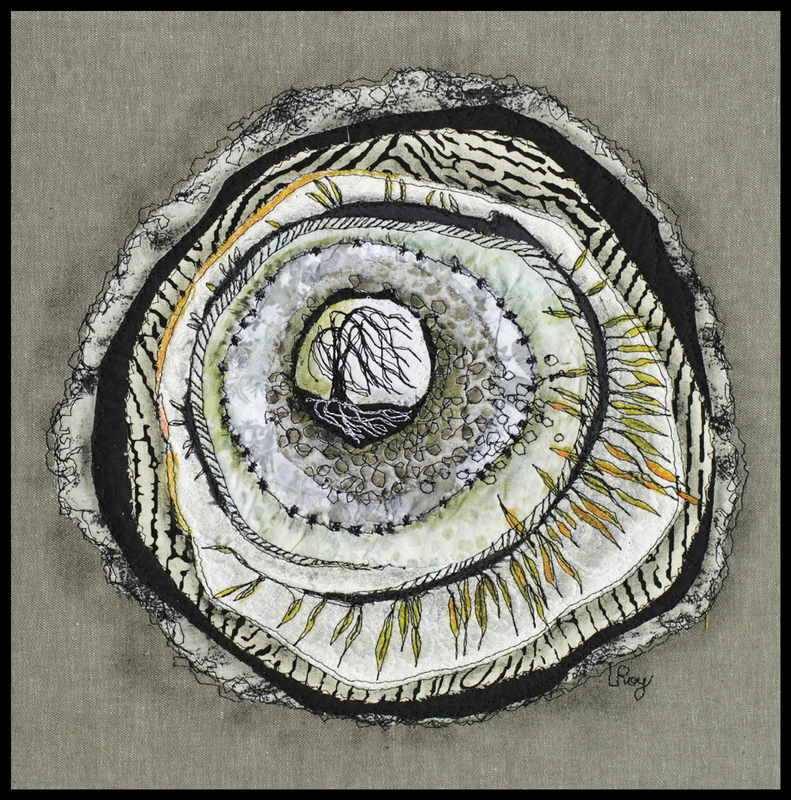 I layer circle upon circle of fabrics, stitch them down, and start the journey using free-motion embroidery on my sewing machine. Each one is a fresh meditation, leading me along a slightly different path. As I make more, I discard some motifs while bringing in new ones. With these pieces I put myself into the heart of the tree and work outwards, letting the prints and colours guide the choices. They take a long long time to make. Might tree rings help us understand the language of trees? Is it possible that a tree’s consciousness extends, aura-like, beyond the rough bark of its exterior, like radiating tree rings? Do trees embrace the full cycle of time as they witness the world around them? These are questions I continue to ask as I explore the imagery and possibilities. As I walk in the woods I try to stay open to the fresh perspectives my art has opened up for me. You may well ask, is all this just a stretch? Maybe. But not long ago, inter-plant communication was also considered a stretch. Our scientists have now proven it true. The First Nations people honour and speak to trees. Perhaps in the near future, we will determine without doubt that they are indeed reaching out to us, and are only waiting for us to accept their gift. This entry was posted on Wednesday, January 10th, 2018 at 10:12 am	and is filed under Art making, Available work, Exhibitions and shows, Native Trees of Canada, Woven Woods. You can follow any responses to this entry through the RSS 2.0 feed. You can skip to the end and leave a response. Pinging is currently not allowed. Thanks for explaining that all so well, Lorraine. Of course it makes perfect sense, when I think about it. (too bad about my metaphor not working — I was halfway into thinking it out for a blog!) I am becoming more and more aware of the interconnectedness of all living things — this is both an exhillerating and a sobering thought. Your artwork and your blog are so helpful in encouraging us to push the boundaries of our awareness in that direction. Lately I’ve been struck by the term Luminous Web, which extends down into the smallest things, but also out into apace, and which holds us all in its embrace. Thank you Lorraine. I do enjoy your pushing the supposed limits of sentient beingness. Thanks so much, Charles! So good to hear from you! Hmm. More stuff to noodle on. After I wrote that comment I went online and asked Google if the trees grew from the inside out, and they said the tree grows both ways — the outside is like our skin, shedding layers, and the centre inside is where the new rings are deposited. Wrong, huh? Fascinating thoughts. “Heartwood” — the word appeals to the writer in me, sending me off to wonderland. Thanks for posting these thoughts, Lorraine, and I’m excited by the new directions your work has taken. Here’s a thought to noodle on: trees grow from the inside out. They have many layers of experienced living to protect themselves, but the tender new growth happens deep within. At least that’s how I perceive it. Perhaps I’m wrong? The image I have seems to work for humans, too. Hello Jessie… thank you for sharing your impressions.